As 2007 closes and 2008 begins, one of the great questions that hangs in the cynical European air is how America will carry itself in the world next year. From the outside, the coming election seems less about "the economy, stupid" and more about America's role in the future of the planet. I think it's even deeper than that. I think this election is about how America sees itself. That's not really an existential question, or a spiritual one; mostly, it's a practical question. In this election year, Americans are looking for leadership that can turn spiritual yearnings into practical realities. 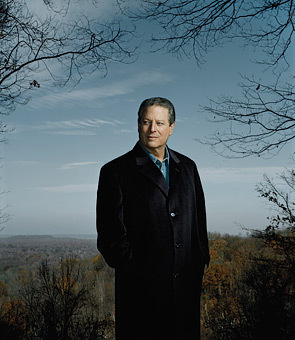 Al Gore is the kind of leader these times require. Not as President  God and the Electoral College have given him a different job. As it happens, Al is at work repositioning his country from the inside out as a leader in clean energy; and along the way restoring faith in the U.S. as a moral powerhouse that can lead a great, global spiritual revival as the temperature rises. That's right, a spiritual revival. Because this apostle of all things digital is the first to admit that technology alone will not reverse the damage done. He says it's going to take "a shift in consciousness." This isn't loopy Sixties stuff, or I wouldn't tune in. Al is tough-minded. He marshals history to make his argument, and countless examples of civilizations changing course and attitudes midstream roll off his tongue. For Al, 2008 is a rendezvous with destiny and an appointment with the enemy. The foe he sees is our own indifference to the future and a lack of faith in our ability to do anything about it. He stresses that through crisis we can find opportunity. His language is pretty Biblical, but, then, doesn't the Bible say something about floods? He is like an Old Testament prophet amped up with PowerPoint and an army of the world's scientists at his disposal. The right response to the global-warming crisis, he explains, will be a mosaic of solutions that will kick off a whole new economic boom, one that is low-carbon and high-productivity, with truly sustainable development, and an atlas for planet management  using not New Age technology but old age wisdom generating sustainable solutions. Is he Noah or are we King Canute? Are we prepared to make difficult choices on behalf of children not yet born? We cannot let the children of the developing world become canaries in the coal mine. If the tide should rise by 3 ft. (1 m), there could be over 100 million climate refugees in low-lying areas such as Bangladesh. If the tide rises 20 ft. (6 m), it's not just the summer homes of rock stars that will take sail; 400 million poor people could be uprooted and at sea. And one man's flood is another's drought: as coastal areas in Africa are drowned, travel inland and anything that isn't underwater will be even more parched than before. Think Sudan. People forget that extreme poverty as a result of desertification explains much of that country's travails. Over the past year, "mild green" (me) and "khaki green" (him) have talked about how the fight against extreme poverty in the developing world and the struggle against climate change can reinforce each other. The poorest will be hit first and hardest by climate change. We can help them adapt, but they can help us, too. Vulnerable as the poor are, they can be powerful allies in stopping the cycle of environmental damage and extreme poverty. With the poor as partners we can slow overpopulation  as we must, because more population means more pollution. And we can help developing countries rev up their economies in a cleaner way than we did during the Industrial Revolution. The choices of the poor affect us, just as ours affect them; we are all part of one world, one moral universe, sharing one oxygen tank. Desmond Tutu often uses the word ubuntu, meaning "I am because we are." It's my favorite epithet, an ode to interdependence. When I told Al that, he responded with Gandhi: Satyagraha, meaning "hold tight to the truth." Personally, I'm trying to live up to both words, but it's hard. Like a lot of folks, I've got a lot on my plate without trying to make sure the dishwasher liquid is in a biodegradable container. (It is, but were it not for the eco-warrior with whom I share a bed, I would have fallen behind.) As Al leaves our house, I fall over myself to explain that my fancy car runs on ethanol, then laugh nervously, like when you meet a parish priest in the supermarket and it turns into confession.